Huge model train collector here. 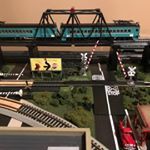 Enjoy posting about HO and O gauge model trains and real trains. I also like to share pics of my travels from around the world. Demographic data for @natestrainsandtravels' audience is available for free to influence.co users.